Our average summer temperatures are predicted to keep rising, such that by the middle of this century, we can expect what are now heatwave temperatures in most summers. 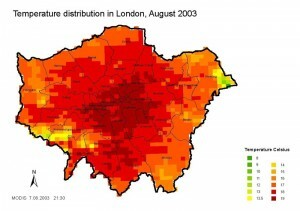 London also generates its own microclimate, known as the Urban Heath Island (UHI), which can result in the centre of London being up to 10°C warmer than the rural areas around London. This can aggravate the effects of hot weather. 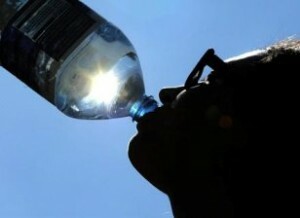 Summer heatwaves may make our homes, workplaces and public transport uncomfortable, and can have affect on health, particularly of vulnerable people. High cooling demand due to hot weather may also place pressure on London’s power supply network and cause ‘brown outs.’ The increased electricity demand for cooling will also affect London’s sustainability. The Urban Heat Island (UHI) describes the increased temperature of urban air compared to the rural surroundings. The term ‘heat island’ is used because warmer city air lies in a ‘sea’ of cooler rural air. The figure to the right indicates that temperatures rise from outer London and peaking in the city centre. The map also shows how temperatures can vary across a city – this depends upon the nature of the land cover, such that urban parks and lakes are cooler than adjacent areas covered by buildings. The higher urban temperatures are caused by the increased capacity of the urban land surface (eg. roads, buildings, pavements) to absorb and trap heat. This results in towns and cities remaining noticeably hotter than the surrounding countryside, particularly at night on calm, clear summer nights. The UHI can add 5-6°C to the night time temperatures experienced. During the summer heatwave of 2003, differences of up to 10°C between city and rural temperatures were measured in London. The GLA commissioned research into London’s UHI – ‘London’s Urban Heat Island: A Summary for Decision Makers’. The UKCP09 climate change projections used a land surface scheme that does not include recognition of urban land surface that modifies the climate of cities through the UHI effect.